Front Room Gallery is proud to present “Pain Relief “ by Joanne Ungar. This solo exhibition features large scale pigmented waxworks which embed evidence of current available methods to relieve physical or mental suffering. All the artwork in this show contains boxes for products that deliver pain relief, items for either numbing ourselves or for altering our reality. Among these items are alchohol, OTC medications, Rx medications, confections, cosmetics, and digital toys. 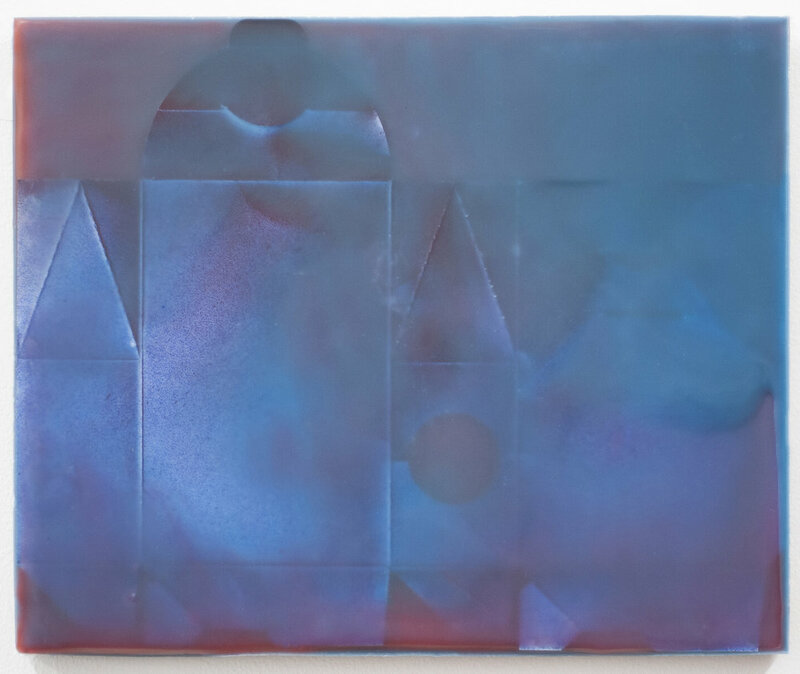 These poured wax paintings by Joanne Ungar are composed with the geometric forms of recycled packaging, and layered and infused with pigmented wax. 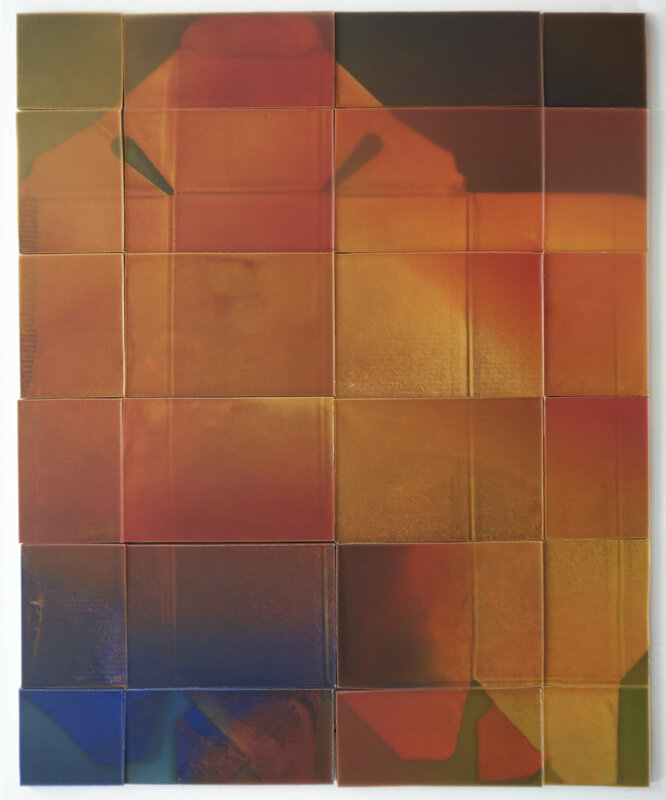 Ungar's complex sense of color transforms base patterns through multiple luminous strata of graded hues, overlaid with controlled density to either obscure or reveal the accumulated layered color. Her luminous wax paintings are created with refined, purified beeswaxes and commercial grade paraffins with very high melting points, creating work that is archival and stable. Ungar’s work invites an innate introspection, with its bright colors and a reduced, yet complex palette. The look of the work belies the subject: pain relief. The sharp corners and graduated angles are reminiscent of early cubist works by Braque or Picasso. Their masterworks sought to create a three dimensional impression in a two dimensional space. Ungar’s work actually IS three dimensional. From the sidelong view one can see how deep the wax is, but frontally it is visually disorienting: sometimes the forms are right at the surface, but at times seem to fade into the distance. These physically encapsulated structures feel like landscapes, or often cityscapes with abstracted modular building forms getting sharper and fading in the distance. The wax has an inherent atmospheric tone, of sky, fog, or water. And the boxes themselves replete with repetition, angles on angles, do not readily divulge their humble origins. These pieces are cast in thick wax, and the depth is visceral. Joanne Ungar is an alchemist. Her studio is a science lab. A visitor to her studio will meet Joanne, with her friendly self-deprecating Midwestern demeanor, and then immediately will be overwhelmed by the stovetop coils, high tech ventilation, vice wrenches, plywood molds, complicated presses and saws, and the carcasses of discarded experiments orderly stacked and categorized. Ungar’s father was a scientist. When she was growing up he talked about how art and science were really one and the same thing: a methodical exploration of ideas crossed with joyous creativity and some random surprises. Built on these origins and continuing into an intense studio practice Ungar states: “I often set up “experiments” with variables and a control group in order to solve a problem of opacity or pigmentation, for example. I also like to push my materials beyond my understanding of them: seeing what happens when they melt; seeing what will stick to what and for how long; what happens to them at stupidly high temperatures. I am ridiculously methodically organized, and in addition to cataloging each piece, I sometimes catalog it through its various versions/changes.” This highly dedicated and rigorous studio practice creates astounding results that have transformed modest materials into ‘gold’. This exhibition explores the origins of constructed forms from recycled and repurposed packaging materials. The pain relievers themselves have been removed, yet the implication is present in the title of the works. Look close and investigate — Ungar is an expert in misdirection and illusion, and the barrier between the illusionary space and physical becomes blurred into a wholly new modality. Ungar is originally from Minneapolis. After studies at Oberlin College in Ohio she moved to New York City and earned a BFA from the School of Visual Arts. Joanne Ungar is a New York Foundation for the Arts NYSCA/NYFA Artist Fellowship program Grant recipient. Ungar has exhibited extensively in New York and nationally. Ungar currently works in Brooklyn, New York.